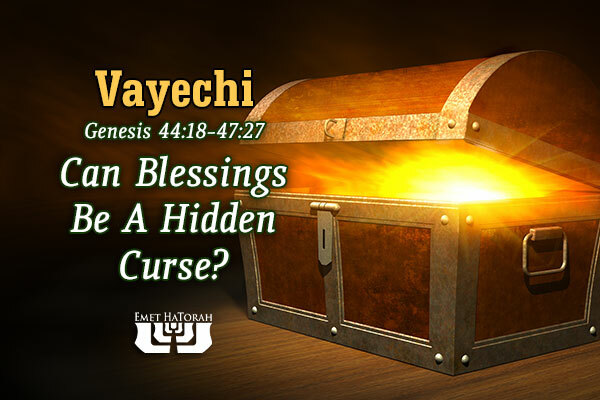 Can Blessings Be A Hidden Curse? Parashat Vayechi begins differently than all other parashot. It is the only parashah in the entire Torah that is attached to the previous parashah without any means of additional spacing. Unlike all of the other portions, there is no break between Vayigash and Vayechi in the Torah scroll. The sages interpret this in a number ways, as they consider the breaks and spaces in the Torah scroll to be equally as important as the letters, and for good reason. Since the spaces within the Torah are used to serve specific functions, there must be a lesson in this peculiarity within the Torah. One interpretation of this anomaly is that the lack of space between this portion and the previous one is supposed to teach us something about Jacob's children. Rashi proposes that once the children of Israel lost their father, the spiritual leader of the emerging nation, their foresight was cut short. Their fate was concealed from them. Their lives were like a snowball rolling downhill, gathering mass and momentum. There was no time to reflect after the death of their father. They lived as if there were no tomorrow, spiraling toward their fate unaware. Each day ran into the next, until they awoke abruptly in the chains of Egyptian slavery. We have the potential for this to be repeated in one way or another in each one of our lives also. How so? Sometimes life can get away from us. Sometimes we are so caught up in creating a livelihood or getting the kids off to their soccer games that forget the things that are important. Sometimes we are so distracted by our jobs and “getting ahead,” that we lose sight of the things that should be most dear to us. Therefore, we have a constant reminder to guard against this in the daily Amidah (the pinnacle of any prayer service). We ask the LORD to bless us “for the good.” We say, “Bless for us, Hashem our God, this year and every type of produce for the good.” Why is the expression, “for the good” added to this prayer? Why don’t we just ask for blessings in general? Aren’t all blessings good? Not necessarily. Take for instance the successful businessman who prospers wildly, but he never has time for his wife and children. When one’s business dealings are “successful,” they can often become all consuming, allowing little to no time for personal pursuits or spiritual endeavors. Or what about the one who suddenly comes into an enormous amount of money without any previous experience of managing money properly? Statistics show that the vast majority of those who win a large amount of money generally end up broke and worse off than before their windfall within one year. According to these findings, winning the lottery may seem like an incredible blessing, but could end up being a curse. We need to constantly pray that the steps we take today will lead us in the proper paths tomorrow. We don’t want to be obsessed with business success at the cost of our families, or our health, or even our own soul. Yeshua said it this way, “For what does it profit a man to gain the whole world and forfeit his soul?” Will our spiritual eyes be closed and our discernment be cut short to what lies ahead, or will we take our every step with discernment and eyes wide open? May every blessing we receive be “for the good,” and not to our detriment.